The best look ever inside a womb of star birth reveals a force at work astronomers were not aware of. Like a baby's first ultrasound, scientists peered into a stellar envelope to capture the earliest and most detailed view of a collapsing cloud of gas and dust, NASA announced Tuesday. The images were made mostly with the European Space Agency's XMM-Newton X-ray observatory. Some previously unrealized energetic process, likely related to magnetic fields, is superheating parts of the cloud, nudging it to become a star, scientists said. The detection of X-rays from the cold stellar precursor surprised astronomers. The observations reveal that matter is falling toward the core 10 times faster than gravity could account for. "We are seeing star formation at its embryonic stage," said Kenji Hamaguchi, a NASA-funded researcher at the Goddard Space Flight Center. "Previous observations have captured the shape of such gas clouds but have never been able to peer inside. The detection of X-rays this early indicates that gravity alone is not the only force shaping young stars." 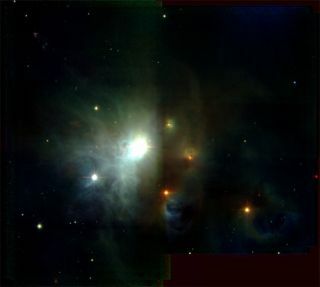 Observations by other telescopes confirmed the interpretation of the scene, inside a star-forming region called R Corona Australis, about 500 light-years from Earth. A light-year is the distance light travels in a year, about 6 trillion miles (10 trillion kilometers). The object is between 10,000 and 100,000 years into the process of gathering itself together, researchers said. The cloud temperature is about 400 degrees below zero Fahrenheit (minus 240 Celsius). In a few million years, it will become dense enough to ignite the nuclear fusion that powers our Sun and other stars. The whole setup is spinning, and scientists speculate that magnetic fields accelerate gas to high speeds as it approaches the core. In other high-energy environments, such as around black holes, high-speed gas is known to produce X-rays. "This is no gentle freefall of gas," said Michael Corcoran of NASA Goddard, a co-author on the report. "The X-ray emission shows that forces appear to be accelerating matter to high speeds, heating regions of this cold gas cloud to 100 million degrees Fahrenheit," Corcoran said. "The X-ray emission from the core gives us a window to probe the hidden processes by which cold gas clouds collapse to stars."